With the transition to ICD-10, increased clinical documentation demands, and an alphabet soup of audit agencies, quick access to up-to-date coding and reimbursement information is critical. We can help, with the primary source content and expert tools you need to minimize claims denials and secure your bottom line. Download the Frost & Sullivan white paper, “The Increasing Challenge of Managing Regulatory and Compliance Risk”, for their insight into the many Federal Government drivers of change and developing payment models, state regulatory and private payer issues in flux, and the security and privacy concerns that create regulatory and reputational risk. It's no surprise to Revenue Cycle professionals that the MS-DRG payment process is very complicated with confusing regulations and complex government pricer tools. While each Medicare MS-DRG Payment has a relative weight, an operating portion and a capital portion; there may be a readmission portion, a value-based purchasing (VBP) portion or a HAC adjustment. Additionally, there may even be pass-through, uncompensated care or low volume add-on payments. Download the white paper for an overview of typical MS-DRG payment challenges faced by reimbursement professionals. CPT coding for Interventional Radiology (IR) services has always been viewed as one of the more complex services lines to master, let alone understand! Component coding, complete procedure coding “hybrid” bundled coding—all techniques and options are in play. As a professional responsible for assigning the CPT codes for these services, what are best practices? Pitfalls? We help members of the health care industry to stay in compliance, and defend them when someone says they didn't. It is rewarding to help clients navigate the complex health care field. From the time I started at the Justice Department as a trial attorney, I have always loved litigation because it combines competition, personal relations, strategy and judgment, and academic analysis. Litigating False Claims Act cases, particularly since we were “creating the law” after the watershed amendments to the Act in 1986, provides the perfect opportunity to utilize those practice skills. 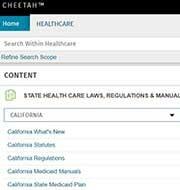 Sign up for our monthly Health News Update, covering Compliance, Medicare and Medicaid Reimbursement, Coding, Health Reform, and Food and Drug Law. Thank you for subscribing to the Health News newsletter!